I’m so excited for the upcoming Sacred Earth Medicine Retreat next month, and there is still room for you to join us!!! Here is an update on some of the heart opening and transformative ceremonies and workshops being offered at this weekend of healing, plant medicine, shamanic healing work, wilderness and ceremony! Each morning we will be gifted with a gentle movement and grounding practice including yoga, breath, and check – in. We begin each day from a place of center and strength, calling ourselves into the circle, and inviting our body, heart and spirit into the practice. 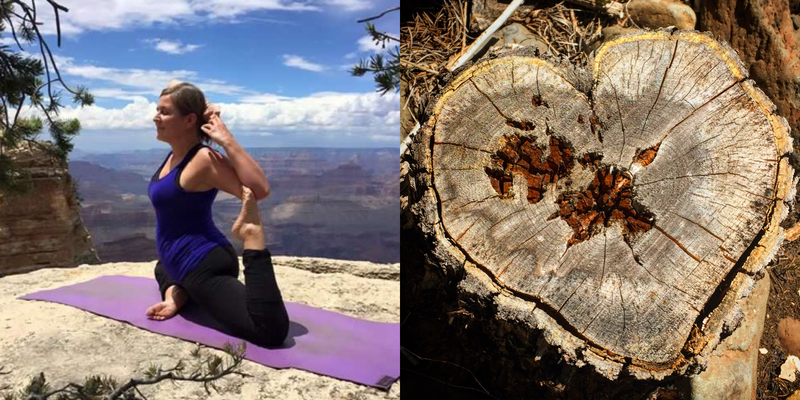 In addition to a daily yoga, movement and grounding practice each morning, Heart Centered Yoga workshops from Meara will help us open and deepen into our heart of power! Workshop # 1- During our Self Love Yoga Workshops, we will work with Mother Earths heartbeat as we discover how to begin living a life based on love, not fear. Prompting questions and the rhythm of the drum will help you uncover fear based, false beliefs holding you back from standing in love with your true self and your life right now. Workshop # 2- Our passive Yin practice will take you deep into your heart and pericardium (heart protector) meridians. Long held poses allow you to shift the energetic blocks protecting your heart and holding you back from true, self love. Our active Yang practice helps to move and release this uncovered energy so you may free yourself of these false beliefs leaving you ready to love yourself fully, exactly as you are. Each night will be highlighted with ceremony, journey work, and sacred space. We will gather around the fire to release, pray, sing, make rhythm and deepen our connection to heart and spirit. Our first night a fire ceremony and journey to release what holds us back from living fully from our heart. Our second ceremony, is an evening of deep heart centered ceremony using the medicine of CACAO, and heart opening, creative, powerful plant ally to help us connect deeply with the voice of the spiritual heart within us, and the Heart of Spirit. We will join together around the ceremonial fire, ready to shed and offer anything up to the fire that is ready to be transformed and transmuted, and call in our highest intentions and dreams through our personal despacho offerings, and we will share a ceremonial preparation of Cacao, and create sacred space for our journey into our hearts deepest callings. Drums, rattles, rhythm makers, voices and songs are encouraged for this energy raising and heart opening evening ceremony with Darcey Blue. Our last evening ceremony will take us in the lodge for a gentle purifying sweat ceremony. We return to the heart of the Mother, the Womb of the Earth, working with all the elements and directions. This sweat is not meant to be intense and challenging, but a sacred space to come completely clean, rebirthed and connected. Do you want to join us?? This gathering will be focused on working with the energy of Living from the Empowered Heart. We will learn about herbs, essences, yoga, shamanic practices and ceremony to connect with our deepest hearts desires and expressions, and how we can live a life in connection with our full hearts. This is work for all hearts, regardless of heartbreak, age or life experience. We will connect with plant allies and teachings to support us wherever we are, though our focus is on empowerment and connecting with the heart as an organ of perception and wisdom/guidance. Through our broken hearted experiences, we find medicine to share in our lives and to increase our joy and magic! We have a few more spots available in this amazing gathering, and payment plans an option!!! Registration is closing in 10 days!! but there is still time for you to join us!! Take a breather, take space, make ceremony, nourish your heart, and join in community. The quality of our dreams are both a reflection of our thoughts and actions as well as a foreshadowing of the fate of our souls in the next life…A nightly, temporary karma that beckons us to change -for the good- so as to avoid a more permanent karma. An analogy on life, death, the dreamstate and the symbolism intertwined within the human experience. We human beings are not moving in the -abstract- motion of a straight line towards death (for instance, the numerical straight line of say 1-89), rather we are moving in the motion of a figure 8. The Figure 8 is a natural repeating pattern that is divided into two halves and is thus the perfect symbol to represent the human life cycle and our two primary states of existence that we are continuously moving in and out of -the awake state and the dream state. While conceiving this analogy I realized life and death must be perceived -from one point of view- as seperate entities(the transitional analogy), but must also be perceived -from another point of view- as inseperable entities(the symbolic analogy) -both of which are ultimately linked by the dream state. The symbolic analogy consists of the untwined figure 8 of life/the ‘circle of death’ abstractly overlapping the ‘circle of life’/the earth -with the overlappment representing the dream state (like the common area in a venn diagram), which implies that the dream state is just as much a part of life as is of death (by which semi-explains precognitive dreams, prodromal dreams, “visitations” by deceased relatives, etc; for the dream state has a foothold in the afterlife) and is based on the premise that “while our body sleeps, our dream state symbolically represents the state that awaits upon our body’s ultimate rest. In other words, while we are lying down and -sleeping/dreaming, this natural process symbolizes where we go when we’re ultimately lying down/dead -to a place “like” our dream state…A state “of mind”, with our body’s physical bonds eternally engrained and intertwined.